Mike Chaney, Mississippi’s 11th Commissioner of Insurance and State Fire Marshal, is currently serving his third term in office. First elected in 2007, Chaney brought extensive business knowledge and experience to the office combined with 15 years of service in the Mississippi House and Senate. His priorities throughout his terms in office remain steadfastly committed to consumer protection and application of technology for efficiency of the department to serve the state and consumers. He is leading the department in making strides in healthcare reform; disaster recovery from flood, tornado and hurricane events; bail bond industry reform; and reductions in state fire deaths. An active member of the NAIC, Chaney serves on numerous committees, task forces and working groups. Among the issues he is involved in addressing are examination oversight, accounting practices, producer licensing, health insurance and managed care, senior issues, catastrophe and property and casualty insurance. As Commissioner, he was inducted into the Insurance Hall of Fame at his alma mater, Mississippi State University. He received the Distinguished Service Award from the University of Mississippi Risk Management and Insurance program and its Professional Society. He has been named one of the top insurance professionals by Insurance Business America Magazine, and was named a Healthcare Hero by the Mississippi Business Journal. 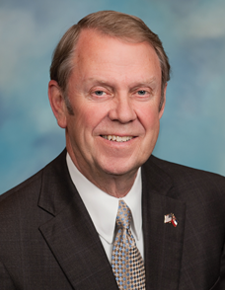 Commissioner Chaney has served on numerous community development entities and corporate boards. He is also a Rotarian and Paul Harris Fellow. He is a veteran of the United States Army, serving in Vietnam. Chaney and his wife, Mary have three children and eight grandchildren. The Commissioner of Insurance is elected to a four-year term and may be re-elected. Miss. Code Ann. § 83-1-1 et seq. The Commissioner is charged with execution of all laws relative to insurance companies, corporations, associations and fraternal orders, their agents and adjusters. The Commissioner licenses and regulates the practices of all insurance companies, agents, burial associations, fraternal societies, bail bondsmen, and other entities engaged in the business of insurance. The Commissioner, as State Fire Marshal, acting through the State Chief Deputy Fire Marshal, investigates all fires called to his attention occurring in the state, licenses manufacturers, installers/transporters and dealers of mobile homes and regulates their practices. The Commissioner, through the State Fire Marshal Division, administers the Mississippi Fire Prevention Code. The Commissioner, through the Fire Service Development Division, establishes guidelines, use and accountability for municipal and county fire protection funds. The Commissioner administers the Liquefied Compressed Gas Equipment Law (Miss. Code Ann. § 75-57-1 et seq.) and enforces the National Fire Protection Association Code, Books 54 and 58. The Commissioner encourages and supports all employees to attain and maintain professional designations in their career fields. The Mississippi Surplus Lines Association (MSLA) is a non-profit association created to provide a stamping procedure for all eligible non-admitted/surplus lines insurance policies sold on risks to ensure the proper payment of premium taxes to the State of Mississippi. This association, under the direction of the Commissioner, has no separate regulatory powers. MSLA enables the Department to ensure that proper taxes are paid to the State of Mississippi. As a result of this law, the State receives additional taxes that were not received in previous years. Miss. Code Ann. § 83-21-17 et seq. Health Insurance Management Board – Commissioner Chaney serves on this board, which oversees the activities of the statewide Children’s Health Insurance Program, established under Title XXI of the Social Security Act to provide child health care assistance to targeted, uninsured, low-income children. Miss. Code Ann. § 41-86-1 et seq. Mississippi Automobile Insurance Plan – Commissioner Chaney or his designee attends meetings of the Mississippi Automobile Insurance Plan, which was created to provide automobile insurance coverage to eligible individuals who are unable to obtain such coverage through the voluntary market. Miss. Code Ann. § 63-15-65 et seq. Mississippi Comprehensive Health Insurance Risk Pool Association – Commissioner Chaney appoints four members to this nine-member board, which provides a mechanism to make health and accident insurance coverage available to those citizens of Mississippi who, because of health conditions, cannot secure such coverage. Miss. Code Ann. § 83-9-211 et seq. Mississippi Fire Personnel Minimum Standards and Certification Board – Commissioner Chaney serves as an ex-officio member of this board, and appoints fifteen members to this seventeen-member board. The Director of the State Fire Academy also serves as an ex-officio member of the board. Miss. Code Ann. § 45-11-251	et seq. Mississippi Fire Prevention Code Board of Adjustments and Appeals – Commissioner Chaney appoints all five members to this board per the Standard Fire Prevention Code as adopted by Miss. Code Ann. § 45-11-103 et seq. Mississippi Insurance Guaranty Association (Property and Casualty) – Commissioner Chaney approves the members of this board, which consists of not less than five nor more than nine members. The Association assists in the detection and prevention of insurer insolvencies and provides a mechanism for the payment of covered claims for insurance policies written by licensed property and casualty insurance companies to avoid excessive delay in payment and to avoid financial loss to claimants or policyholders because of insurer insolvencies. Miss. Code Ann. § 83-23-101 et seq. Mississippi Life	Health Insurance Guaranty Association – Commissioner Chaney approves the members of this board, which consists of not less than five nor more than nine members. The Association assists in the detection and prevention of insurer insolvencies and provides a mechanism for the payment of covered claims for insurance policies written by licensed life and health insurance companies to avoid excessive delay in payment and to avoid financial loss to claimants or policyholders because of insurer insolvencies. Miss. Code Ann. § 83-23-201 et seq. Mississippi Tort Claims Board – Commissioner Chaney serves on this board, which provides coverage to governmental entities for every risk for which the board determines the respective governmental entities to be liable in the event of a claim or suit for injuries. Miss. Code Ann. § 11-46-18 et seq. Mississippi Rural Risk Underwriting Association – Commissioner Chaney approves the plan of operation of this association, which is charged with providing essential property insurance coverage to eligible individuals who have been unable to secure such insurance through the voluntary market. Miss. Code Ann. § 83-38-1 et seq. Mississippi Windstorm Underwriting Association – Commissioner Chaney approves the plan of operation of this board and appoints three members to the board, which coordinates the availability of wind and hail coverage in the six Mississippi Coastal counties (Hancock, Harrison, Jackson, Pearl River, Stone, and George). Additionally, a designee of the Commissioner attends each meeting of the Association. Miss. Code Ann. § 83-34-1 et seq. Mississippi Workers Compensation Assigned Risk Plan / Mississippi Workers Compensation Assigned Risk Pool – Commissioner Chaney is responsible for administration of the Mississippi Workers Compensation Assigned Risk Plan, and its reinsurance mechanism, the Mississippi Workers Compensation Assigned Risk Pool, as stipulated in Miss. Code Ann. § 71-3-111 et seq. The Plan and Pool are organized to provide coverage to eligible employers who seek workers compensation coverage and are unable to obtain such coverage through the voluntary market. Rural Fire Truck Acquisition Assistance Review Committee – Commissioner Chaney chairs this committee, which is responsible for reviewing all applications for compliance in regard to established guidelines for applicants to the Rural Fire Truck Acquisition Assistance Program as outlined in Miss. Code Ann. § 17-23-1 et seq. State Employees Health Insurance Board Advisory Council – Commissioner Chaney serves on this council, which is responsible for advising the State and School Employees Health Insurance Management Board concerning the design of a state insurance plan for state employees. Miss. Code Ann. § 25-15-9 et seq. State Liquefied Compressed Gas Board – Commissioner Chaney oversees this board, which is vested with the power to regulate matters pertaining to liquefied compressed gas in Mississippi. Commissioner Chaney appoints seven members to this board, including one from each of Mississippi’s five congressional districts, as well as two at-large members. Miss. Code Ann. § 75-57-1 et seq.